RALEIGH, North Carolina, April 17, 2011 (ENS) – From Thursday through Saturday, tornadoes ripped across communities of the southern United States from Oklahoma to North Carolina leaving at least 44 people dead in their wake. 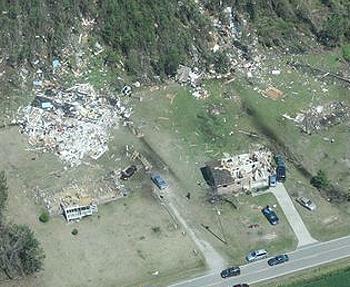 A total of 241 tornadoes in 14 states were reported over the three-day period. This tornado outbreak ranks “among the largest in history,” said Accuweather meteorologist Meghan Evans. Late Saturday night, the storms moved offshore, and the National Weather Service Storm Prediction Center in Norman, Oklahoma is forecasting no organized areas of severe thunderstorms across the country today. 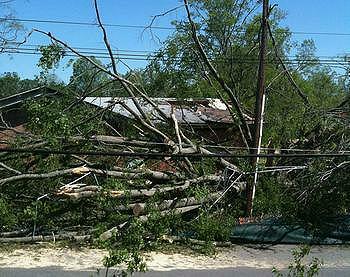 The deadly storms first struck Thursday in Oklahoma, where two people were killed. As they blew across the country seven people died in Alabama; seven people in Arkansas; seven in Virginia; and one in Mississippi, officials said. In North Carolina, the state hardest hit, the estimated death toll has been revised down to 22 from 23, according to unconfirmed reports from communities across North Carolina. About 130 people are reported as injured, with most transported to hospitals for care. A large tornado whirled through downtown Raleigh, North Carolina’s capital city, on Saturday, cutting a wide swath of destruction. Governor Bev Perdue has declared a state of emergency for North Carolina, putting the state’s emergency management plan into action and providing financial resources for communities affected by the storms. Governor Perdue and and First Gentleman Bob Eaves visited stricken communities today to get an up-close understanding of the extent of the devastation. More than 130 homes have been destroyed and more than 700 are reported as damaged. The Federal Emergency Management Agency has dispatched a federal coordinating officer to Raleigh and the American Red Cross State Disaster Coordination Team will establish a team to assist local chapters. U.S. Senator Kay Hagan, a North Carolina Democrat, also toured the Shaw University campus with Shaw University President, Dr. Irma McClaurin, Mayor Charles Meeker and members of the Shaw community. 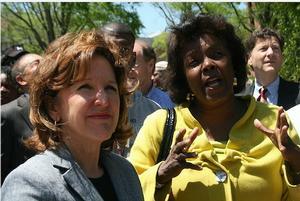 Hagan spoke with Shaw students, faculty and alumni, as well as first responders on the scene, during her visit. Due to the immense damage to the campus from Saturday’s storms, Dr. McClaurin announced earlier in the day that the university would be closed for the remainder of the semester. Hagan toured the wreckage at the Lowe’s in Sanford, where employees heroically guided all customers to safety during Saturday’s violent storms. She was joined by Sanford Mayor Cornelia Olive and store manager Mike Hollowell. While in Sanford, Hagan also toured the damage at Static Control, the largest employer in the city, and walked through the St. Andrews neighborhood, where many homes were destroyed by the storms, to meet with local residents and hear their experiences. 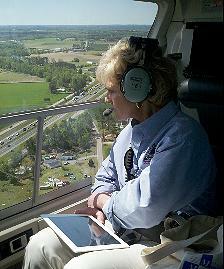 “As I toured the devastation across Sanford and Raleigh today, I was overcome with many emotions: sorrow for those who have lost loved ones, admiration for those who courageously helped their neighbors and friends to safety, and determination to do all that I can to get affected North Carolinians back on their feet,” Hagan said. As search and rescue crews comb the ruins for survivors, Governor Perdue has suspended the restrictions on work hours for utility workers in order to allow the work necessary to repair power lines and waived the restriction on driving hours for truck drivers to allow for the transportation of supplies to affected communities and for the removal of debris.